In a recent article for the Excel community, I showed an improved version of the Excel Concatenate() function. While writing that article I realized that no one had written an EE article on a general purpose fast concatenation function for VB and VBA developers. The VB.Net community enjoys the StringBuilder class and that (fast concatenation) is a missing functionality for the VB/VBA developer. If you are interested in the different performance characteristics of the intrinsic VB concatenation operators (& and +) and alternatives, please look at the prior article's attached VB project files and performance summaries. There are several different development environments in which to create and consume this functionality. I will use an Office 2003 environment for these examples. Let's put on our OOP goggles for a moment and talk about our design. We need to append strings to our object and retrieve the concatenated string. As a nice feature, let's provide the ability to insert some delimiter text between our concatenated strings. We will need an ADD method that is passed a string. We will need a TEXT property (read/write = set/get). We will need a DELIMITER property (read/write = set/get). We want our class to perform well, so we will add fast performance as decision criteria. This will add a Class Modules node to your current project and add a Class# module, where # is a sequential number, starting with 1. If you open the new module, you'll see that it only contains a General Declarations section. We are going to use the Insert | Procedure menu three times. The first two times, we are going to create a Property (Text and Delim). The third time, we are going to create a Function (Add). These skeletons are a nice start, but we need to tweak them to get our desired and best results. We will change the Variant data types to string, changing the parameter variable name, and add a parameter to the Add method/function. We will store data in private variables in the class's General Declarations section. In this case, we need a collection object to hold the strings as they are added and we need to hold any delimiter string. We need to add code that will transfer data to/from our private variables. 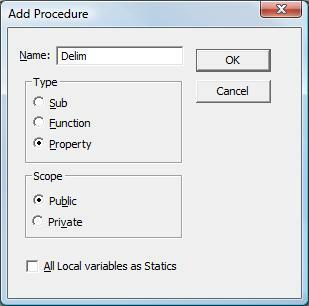 The Delim property is the next simplest -- it stores and retrieves the strDelim private variable value. The Text property code is a bit more complicated. Since we need to concatenate our appended string segments, we will get better performance if we store the concatenated string as the first, and only, item in our collection. Likewise, we need to reset our collection and make the first, and only, item the supplied string if the invoking code assigns a value to the object's Text property. Finally, we need to instantiate and remove the collection object when our class is created and destroyed. Add the following routine to a module. We will instantiate the new class, append some 36 character strings to the class, and either print the length of the concatenated string or print the concatenated string to the Immediate window. Const AtoZ As String = "ABCDEFGHIJKLMNOPQRSTUVWXYZ"
In the Immediate window, invoke the testBuildString routine, passing an iteration value. In the following snippet from my test, I printed the iteration value along with the before and after values of the Timer. The routine exhibited sub-second performance until we reached the 100k iteration value. 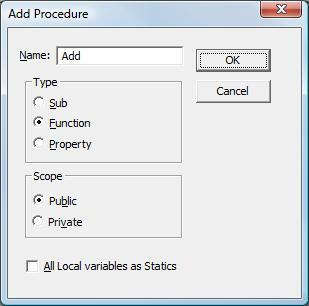 Here is the class module that you can import into your VB/VBA project. If you want the ability to concatenate the same string segments with different delimiters, you could use the Replace() function to change the delimiters in the concatenated string. Alternatively, you could change the class to not reset the collection when the Text property is retrieved. I leave it to you to add that new property and behavior to your class module as a programming exercise.